Talk About Making the Tough Choices in Mass Effect 3 at Kotaku Game Club! 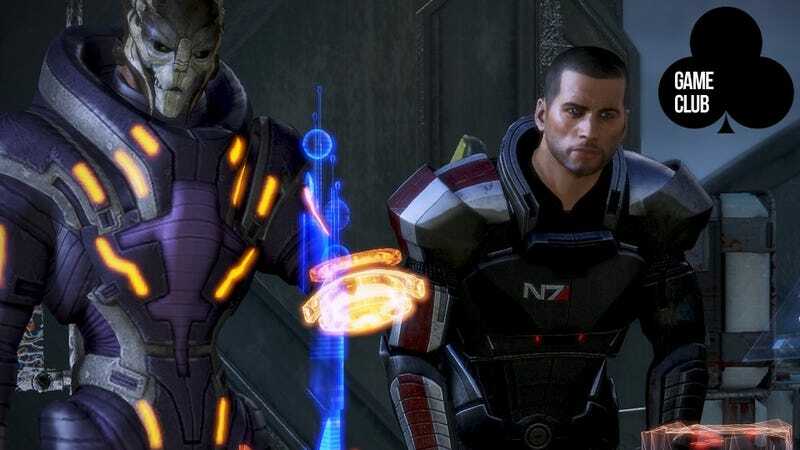 Welcome back to the Kotaku Game Club's discussion of Mass Effect 3. We'll be covering the middle portion of the game's campaign today, picking up where left off last week, after the mission on the Turian Moon of Menae, and looking at everything through the mission on Thessia. It's a lot of material, but some of you thought we weren't covering enough ground last week, so taking a bigger bite this time. Since we're discussing the campaign again, remember that today's discussion will be full of spoilers. If you haven't been to Thessia yet, I suggest doing so before joining the conversation. First time participating? Here's the deal: The Kotaku Game Club exists because no one wants to experience a game alone. Even if we're playing individually, it's always more interesting to share our thoughts and hear other peoples' perspectives. The Game Club picks a different game every month to play as group so we can meet to discuss its narrative and mechanical themes and reactions to them. We meet on Kotaku every Thursday at 4pm Eastern, and our discussions take place in the comments section of designated Game Club posts like this one. Is deciding the fate of entire species more or less emotional than deciding for your own characters? Mass Effect 3 is supposed to be about making tough choices: The decisions Shepard makes may very well define the future of every living being in the galaxy. The weight of the world is on his or her shoulders. The question is, are you feeling the pressure, too? Mass Effect 2 built tension by putting the fate of individuals in your hands. These were characters who you could look at and talk to. Mass Effect 3 asks you to make decisions on behalf of billions, most of whom you'll never see, regardless of whether they live or die. Does widening the scope of Shepard's decisions make them more difficult, or are the consequences so unimaginably large that you emotionally detach yourself from the situation? Next week we'll be discussing the last leg of Mass Effect 3, including the game's ending. It seems like everybody has opinion about how BioWare closed the Mass Effect saga, so there should be a... let's call it a "lively" event. We'll be meeting here on Kotaku next Thursday, March 22nd, at 4pm Eastern.